Don’t be fooled! Despite its tricky name, buckwheat does not contain gluten and is in fact entirely unrelated to grains. Buckwheat is technically a fruit, and more closely related to rhubarb. The great thing about buckwheat is that unlike with other gluten free flours, there’s no need to also use a gum (xanthan or guar) thanks to buckwheat’s natural viscosity when combined with moisture. It’s nearly comparable to what gluten does for baked goods, allowing buckwheat to serve as a safe and hearty replacement for wheat. Even for those who can tolerate gluten, it is an excellent addition to any diet. Amoung countless other benefits, buckwheat has been proven to lower blood pressure and cholesterol, is extremely high in fiber, and can also lower the risk of diabetes. This recipe is perfect for a hearty breakfast on the go or a filling snack, is 100% vegan, gluten free and grain free, and can be made using entirely whole food ingredients! 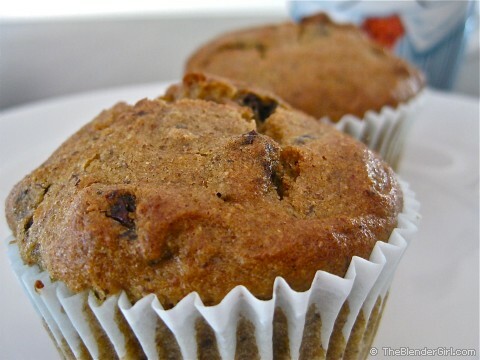 Preheat the oven to 375 F, and line muffin tins with paper muffin cups. You can also omit the paper cups and simply oil the tins. In a large bowl, whisk together the dry ingredients. If you’re choosing to use maple syrup instead of the dry sugars, I’d suggest adding it to the wet ingredients, and would recommend tasting the finished product to ensure it’s sweetened to your liking. In a medium sized bowl, combine the hot water and ground flax seed. Let sit five minutes, then add the melted coconut oil. If melting your coconut oil seems too labor intensive, you could always do your best to measure out the firm oil and let it melt in the warm flax mixture. Add this flax/oil mixture to a large bowl with the applesauce, syrup (if you’re opting for that as a sweetener), vanilla, grated apple, and the raisins or walnuts. Pour the wet mixture into the dry mixture and combine just enough to ensure the dry and wet ingredients are evenly dispersed amongst each other, but DO NOT OVERMIX! Pour the batter into the muffin tins and bake for roughly 25 minutes or until tops are golden brown. Let sit for five minutes then transfer muffins to a wire rack. * Make sure you’re using CERTIFIED GLUTEN FREE baking powder! Wheat starch is often hiding in regular baking powders.